An All About Me (or self) theme is great for preschoolers. They can think more about themselves, what they like, and who they are. They can learn more about the five senses. Preschoolers can learn more about their bodies. They can also explore more about their names. This simple self-portrait activity can incorporate lots of skills and concepts for preschoolers, and it’s easy to prepare and easy to do. The hand mirrors I used were purchased from a discount store. You could probably find hand mirrors at the dollar store. 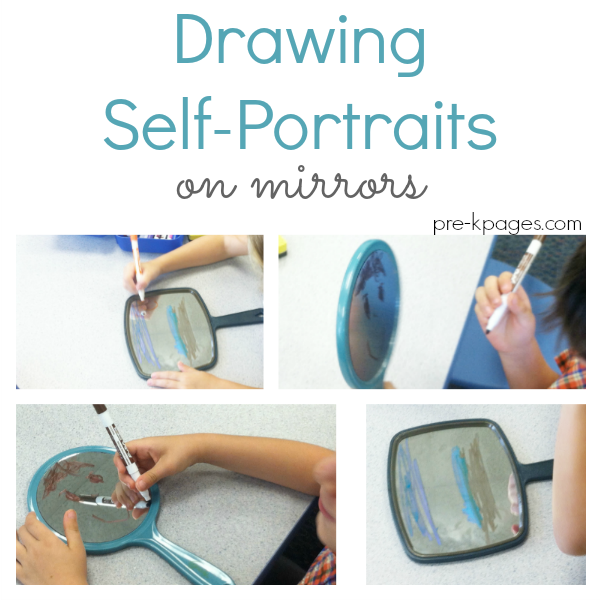 But make sure hand mirrors are sufficient size (large enough for preschoolers to draw on) and are sturdy. You do not want mirrors that will break easily or not withstand a lot of handling by little hands. 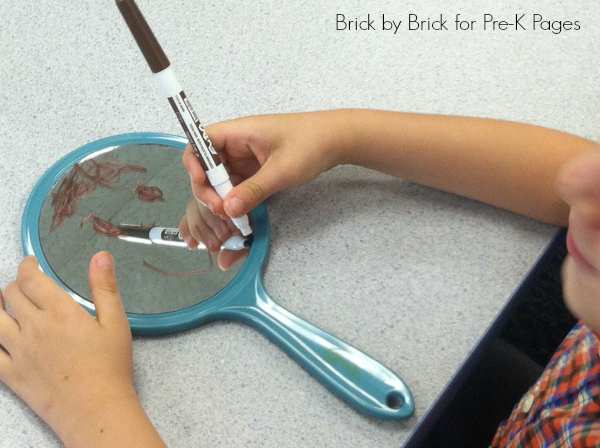 Note: If you have a large nonbreakable mirror in your classroom, you can use that mirror for drawing, too. Our children had used dry erase markers before and did not need any particular guidance or preparation to use them. If your children are unfamiliar with these markers, you may need to give some guidance for using them with care. Dry erase marker will not wash out of clothing (at least not without special treatment). 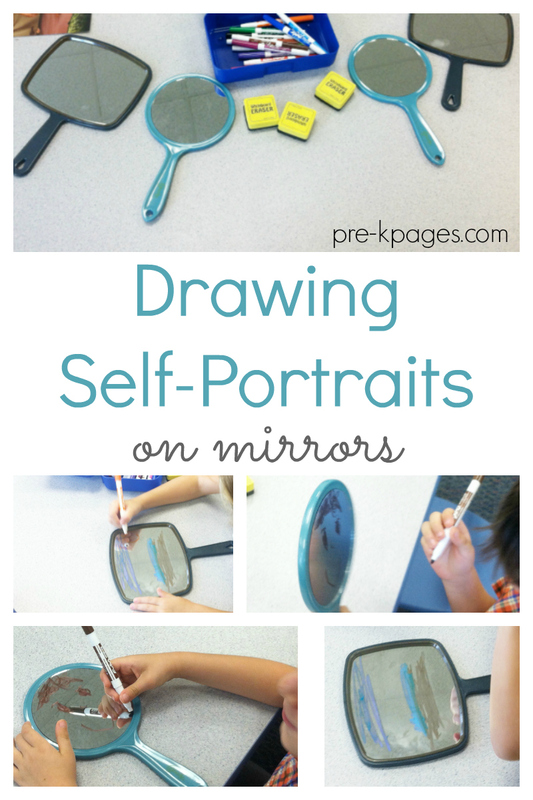 You could use most washable markers to write on mirrors, too. However, you will need damp sponges or towels to wipe off most mirrors. Test whatever you want to use before providing them for the children. 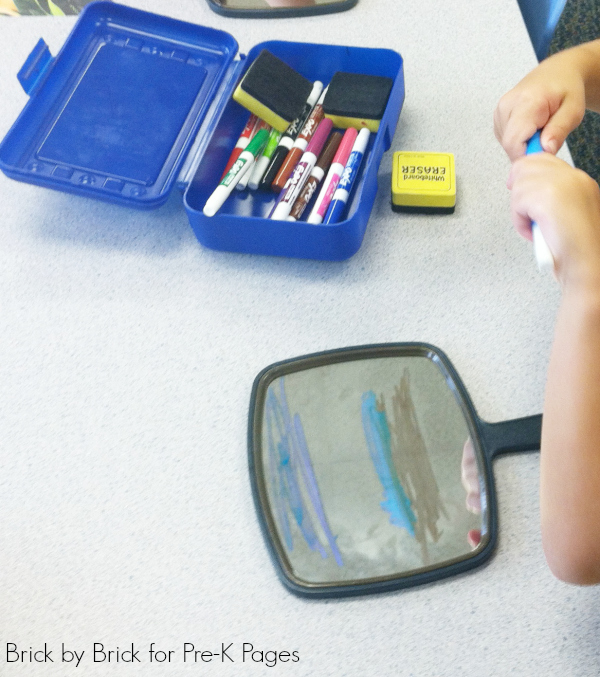 We placed the mirrors, markers, and erasers on a table. I invited children to look in the mirror at their faces and draw their faces on the mirrors with the markers to create self-portraits. Some children wanted to draw other things on the mirrors. Allow some freedom to explore. The experience and the process are key components to the child’s learning and enjoyment. Even if children do not draw faces, at some point encourage them to look in the mirrors and talk about what they see in their own faces. Offer name cards or other key words (eye, nose, mouth, face, hair). 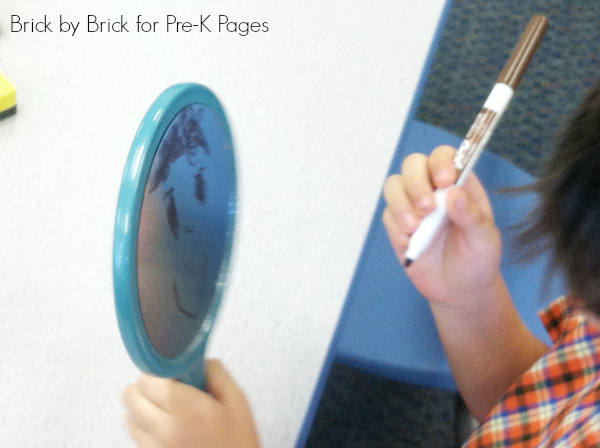 Older preschoolers will enjoy printing names and words on the mirrors. BIO: Scott Wiley is the managing editor for Pre-K Pages. He blogs at Brick by Brick, exploring the connections between play and learning for young children. Every week he learns new things from the children in his church kindergarten class and 4-year-old music class. You can connect with Scott on Facebook, Pinterest, and Twitter. Follow my Senses Pinterest Board for more great activity ideas!